Westphalian ham (German: Westfälischer Schinken) is a ham produced from acorn-fed pigs raised in the forests of Westphalia, Germany. The resulting meat is dry cured and then smoked over a mixture of beechwood and juniper branches. The hams are prepared for consumption solely by the process of smoking, which preserves them, and are typically eaten thinly sliced in their preserved state without additional cooking. 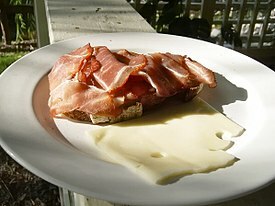 Westphalian ham is famed as a delicacy. During his travels in Germany, Thomas Jefferson documented the production of Westphalian ham and aspects of the hogs used to produce it. In the early 1900s, there were three varieties of Westphalia ham: kugel cut, boneless and rolled, and regulation ham. In the early 1900s, significant quantities of Westphalian ham were being exported from Germany into the United States. In a scene from the 1937 film Easy Living, Edward Arnold's character disdains lobster for breast of Guinea hen served on Westphalian ham. In Season 5 Episode 20 To Market To Market of the television comedy Murphy Brown, Charles Kimbrough's character Jim Dial waxes nostalgically about his summertime childhood memories of Westphalian ham sandwiches. ^ a b c Hayes, Kevin J. (2008). The Road to Monticello: The Life and Mind of Thomas Jefferson. Oxford University Press. p. 363. ISBN 0199758484. ^ a b The Encyclopedia of Healing Foods - Michael T. Murray, Joseph E. Pizzorno. p. 616. ^ a b c d Daily Consular and Trade Reports. Department of Commerce and Labor, Bureau of Manufactures (U.S.). 1912. p. 55. ^ a b Swindled: The Dark History of Food Fraud, from Poisoned Candy to Counterfeit ... - Bee Wilson. p. 11. ^ Processed Meats. p. 344. ^ German Cooking - Marianna Olszewska Heberle. pp. 166-167. ^ The Boston Cooking-school Cook Book - Fannie Merritt Farmer. p. 238. ^ Handbook of Poultry Science and Technology, Secondary Processing. p. 218. ^ Rivers, Frank (1916). The Hotel Butcher, Garde Manager and Carver. Hotel Monthly Press. pp. 45–46. Sauerkraut Yankees: Pennsylvania Dutch Foods & Foodways - William Woys Weaver. pp. 44-45. Cassell's dictionary of cookery - Cassell, ltd. p. 1108.